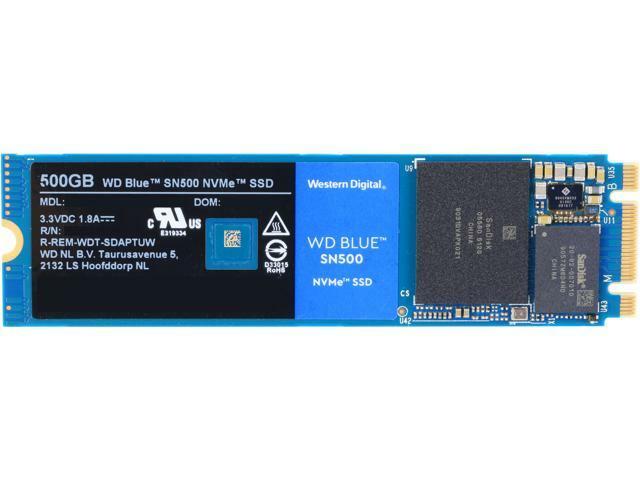 Based on proven technology descended from our WD Black SN750 NVMe SSD, the WD Blue SN500 NVMe SSD enables low power draw while maintaining significantly higher performance over SATA. Fueled by Western Digital an in-house controller and 3D NAND supporting PCIe NVMe interface and DRAM-less configurations. Tested in the Western DIgital F.I.T. Lab for compatibility, WD Blue SN500 NVMe SSDs are certified to work with a wide range of high-performance PC configurations and motherboards. Other Thoughts: I have observed 4K random reads at Q3 depth around 620 MB per second, and writes at the same depth at 520 MB per second. That's pretty fast, even taking into account this newest generation of NVMe drives, that's still pretty fast. This surprised me, as another rig that I own has a slightly older NVMe drive from another company, running at PCIe 3, 4x, and this WD Blue SN500 beats it hands down. This was quite surprising, as indeed, I intended for that to be the performance drive, and this new WD Blue to be the "budget solution." So, here I am, considering swapping them, and wondering how I will manage to do so with my foot in my mouth. If you want ultra-fast performance, then, please get an NVMe with a DRAM cache, which this drive lacks, but, my older NVMe does have a DRAM cache, and yet still slightly underperfoms this simple "budget" drive. Of course, this drive is newly-released, at the time of this writing, and belongs to the latest generation of NVMe. So, the controller and the tech behind the drive are top-notch consumer-grade, so, it makes sense that it can beat some of the older NVMe drives. Still, this drive does have some impressive performance for the price.